Blinking or rotating light signals. WITH the new LED beacon range 829 from Werma, available from Balluff-Leuze , several varying light effects can be achieved with only the one device. It offers permanent, blinking or rotating LED light signals, selectable via a combination of integrated dipswitches. The range offers a high capacity LED flash which, thanks to the application of LEDs, offers a life duration of up to 50,000 hours ensuring an operational life significantly higher than that of conventional xenon flashes. All versions use integrated LEDs in the same colour as the dome. This ensures optimum colour-intensive light effects. 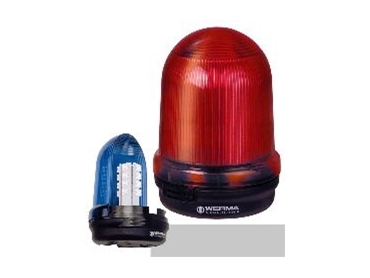 The LED beacons can be easily mounted to machines, brackets or tubes. A wire guard for vandalism protection is available for base mounting versions. All beacon types have a protection rating of IP65.